When James Loeb designed his soon-to-be-launched series of Greek and Roman texts at the turn of the twentieth century, he envisioned the production of volumes that could easily fit in readers’ coat pockets. A century later, that compact format is still one of the collection’s hallmarks. Beginning in September, however, the iconic books will be far handier than Loeb had hoped: users of the Loeb Classical Library  (LCL) will have the entire collection at their fingertips. After five years of dedicated work on the part of the library’s trustees and Harvard University Press  (HUP), which has overseen LCL since its creator’s death in 1933, the more than 520 volumes of literature that make up the series will be accessible online. 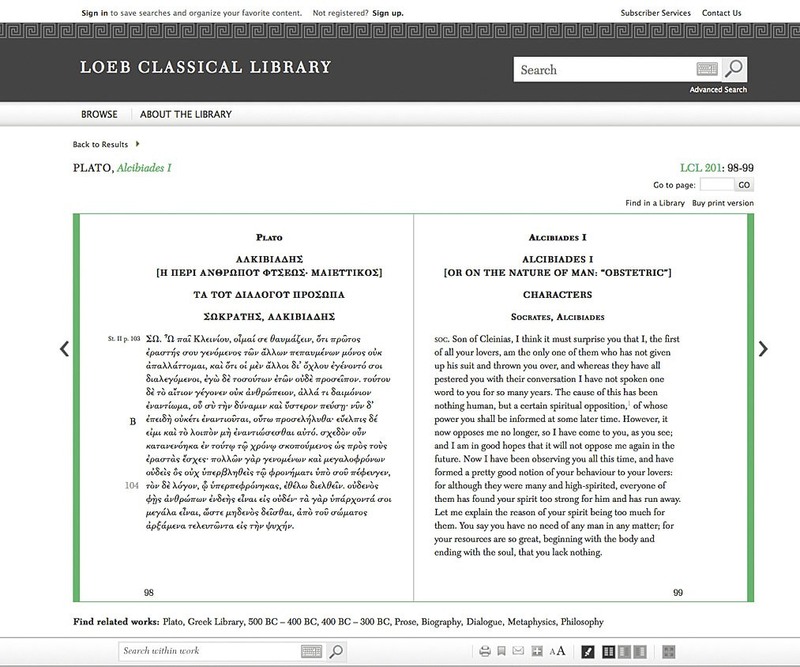 Besides allowing users to browse the digitized volumes, which retain the unique side-by-side view of the original text and its English translation, the Digital Loeb Classical Library will enable readers to search for words and phrases across the entire corpus, to annotate content, to share notes and reading lists with others, and to create their own libraries using personal workspaces. According to LCL executive trustee Richard Thomas , Lane professor of the classics, the digital library will have a remarkable pedagogical function. Instructors, he explained, will be able to link the digital texts directly to their syllabi—a feature he expects to be particularly useful in his own Latin courses. Assistant professor of classics Paul Kosmin  plans to use the virtual library for his survey course, “Classical Studies 97a: Greek Culture and Civilization,” which attracts both students familiar with the ancient language and those who are not. Accessing the bilingual Loebs online during section, Kosmin explained, will equalize the learning experience. “It’s going to be a wonderful, wonderful resource,” he noted, adding that his students will be able to analyze texts together on the digital platform using the annotation feature. Emma Dench , professor of the classics and of history and a scholar of ancient Rome (see Harvard Portrait, March-April 2010, page 49 ), said the up-to-date online versions will replace out-of-copyright translations—which do not “read very nicely” and are less authoritative than the Loebs—that she has often had to use in the classroom. The virtual library, she added, will be especially valuable for instructors who teach courses that require many classical texts. The impact of the digitization project will extend beyond classical studies, Thomas pointed out. The virtual library, he said, will be a “scholarly tool not just for classicists, but for those in English literature, Romance languages, philosophy, history, political science.” Cogan University Professor Stephen Greenblatt  wrote in an e-mail to Harvard Magazine that he can imagine using the digital LCL to explore Shakespeare’s indebtedness to Roman authors like Plutarch, Ovid, and Cicero. “[The classics] remain, after thousands of years, a vital intellectual, scientific, cultural, and spiritual matrix,” he added. Frankfurter professsor of law Noah Feldman  [title updated 8-18-2014] said the virtual library will be useful in his courses on constitutional law and legal theory. “I would far rather refer students to a good text,” he explained, “than have them wandering around on the Internet.” He added that the digital LCL will be particularly helpful for an undergraduate general-education course on power and constraint that he is now designing. Teaching aside, scholars and authors plan to use the digital library to conduct research. Kosmin, whose work on the Hellenistic period involves visiting archaeological sites and exploring the itineraries of ancient monarchs, will no longer need to carry all the relevant Loebs with him during his travels. Wien professor of drama and of English and comparative literature Martin Puchner  (see Harvard Portrait, May-June 2013 ) said that the Loeb website will facilitate his research for a book about the history of world literature that will feature several classical authors. “I use [the Loeb series] to engage classical texts whose original language I know but not as fluently as I would like to,” he noted. Beyond the Harvard community, British novelist and historian Tom Holland  said that he will browse the digital library to inform his forthcoming book about the Julio-Claudian dynasty, instead of paging through several printed volumes from beginning to end.